Included in our Celebrations this summer is what we fondly call the Big Birthday Party. This is THE party of the year...well there is also Halloween but that's different. So, this year to really do it up right I invited Racheal Stevens a local photographer to take photos of my work for the party as well as our children (I can't help myself...they are so cute). 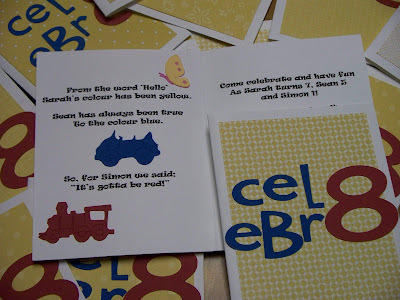 The cupcakes and a snippet of the other goodies I put together for our Yellow, Blue and Red Party. And I can't say I condone the props but my DH loves this...how much cuter can he be??? Last year Sarah had a Playmobile Cake and so for months after that's all I heard from Sean is that he wanted one for his next birthday...not that he was short-changed or anything...his cake last year is one of my favs! Here is the crocodile hunter himself sitting amongst the baby crocs and vines I made! 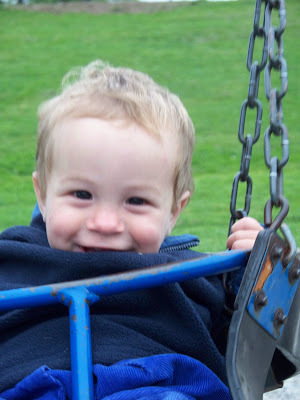 Finally here is one very happy birthday boy! Alright so I searched in my photos and there does not seem to be a recent photo of me...but I am going to join in some fun they have going on over at Pensieve! It's called a Blog Hop! It just sounds like fun to me! A funny thing happened almost 3 years ago...my DH Martin talked me into looking for a house in small town Beamsville. Hmmm...well, we found the perfect house on the main drag in Beamsville...it even had a sweet space for Creative Bug. It was more than we wanted to spend but we couldn't resist...so we have just celebrated 2 years here in our beautiful home and haven't looked back! I quit my job last week...after 9 years..we decided I would stay home and focus on our 3 children and my business. 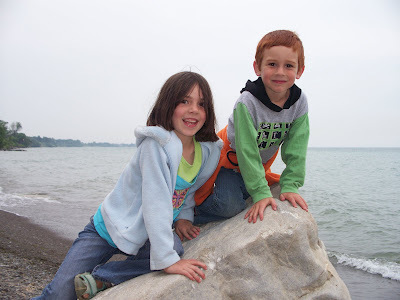 Our children are Sarah (7), Sean (5) and Simon (1). 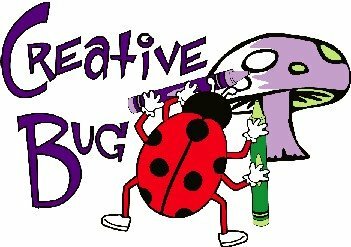 Creative Bug is a business where I mostly run children's birthday parties, make custom cakes and invitations, decorations, etc...It's sure is fun!!! I love my job! I am still coming to terms with having left viable employment...I spent 5 years in university where I completed a BSc in Psychology and then my MBA...hard to believe I gave it up...I think we are going to have some fun with me home though...let's hope so!!! 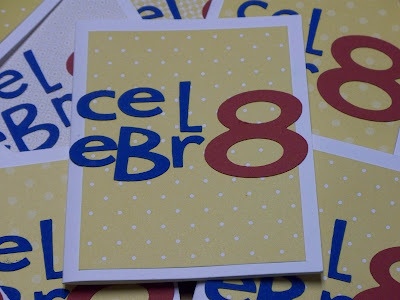 Ohhh, you can find me on Twitter @Cre8vBug and Facebook! Let's hop together! 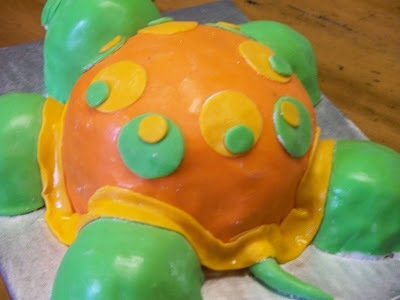 Well, as I mentioned on Monday our days are chalk full of celebrations as of late...but we are often late so here is my Mother's birthday cake...I wanted a beach cake for her as she camps all summer long and loves hanging out at the beach. Now the incredible thing here is that I had the cake iced and the sand laid but the cake was not yet decorated when she called at 10am today and said she was going to pop by!!!! Ack! Wo with little time to spare the kids gave me some ideas and we were off to the races...I made the sand dollars, star fish and shells within an hour and got them on the cake! Sean also insisted that the cake needed a flag so here you go Grama! I know she loved it...we almost made her cry! Here is a special moment between Grama and Simon...aren't they sweet? We sure do love you Grama! 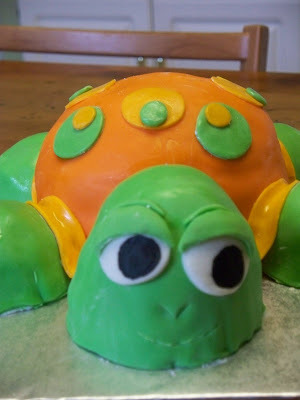 I feel that this is a friendly turtle in need of a name...any suggestions? 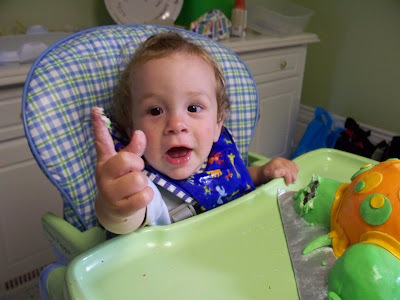 Yes, indeed Simon, you are 1!!! Sean was quite distressed that we let Simon play with the cake...he was ready to pounce on Simon and save the cake for us! Simon didn't actually eat any he just crumbled it in his hands...he will learn to appreciate cake soon enough because it is a cakey time of year over here!!! 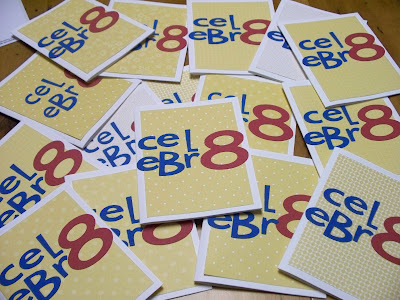 Here are the invitations I made for the celebration up close...these were simple and sweet. I got the idea from the most recent SU! catalogue. Here is the inside... I can't say what makes me want to write these cheesy little poems but they are fun...they make me happy...what can I say? So...what are our celebrations you ask? The list goes on and on...but there are lots of reasons to celebrate! Please look for more of our celebration pics over the coming weeks! I can't believe how fast the summer is slipping by...only 2 more weeks until I go back to work so there is a lot to fit in!!! 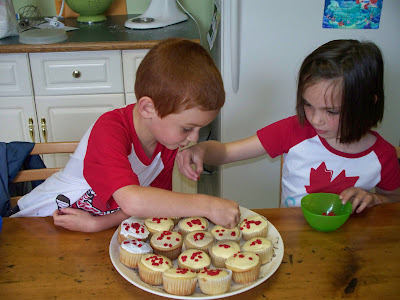 Here are our very Canadian Kids working on some Canadian Maple Cupcakes. 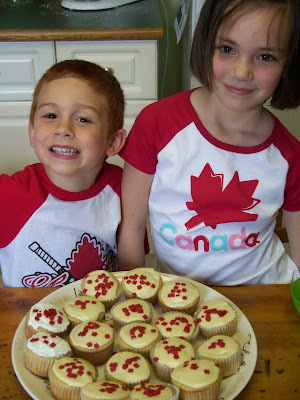 The kids are dressed in the Please Mum Canadian Shirts and the Cupcakes are Martha Stewarts Maple Cupcakes with Maple Buttercream. Yum! Nothing like some Maple Leaf Quins to seal the deal... Sean was just feeling silly that day...what can I say? It's a good thing he's cute! 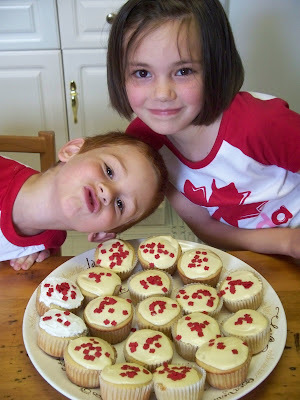 Our Canadian Kids...we went to some celebrations with family later in the day for a BBQ and some bouncing fun. I forgot the camera though! Hope you all had a wonderful Canada and 4th of July!